Names succeed, or fail, in a context. Nike would be a dorky band name. It would make no sense to call a retail electronics store Queen or Dire Straits. Qdoba is an invented word and thus didn’t even have an English pronunciation to begin with, but it’s distinctive, sounds sort of upscale and intriguing, and, as a bonus, the domain name was available. It’s unlikely it would work for your band, shoe manufacturer, or electronics store, but for a Mexican restaurant owned by Jack in the Box it seemed to be just the thing. Nomnym hasn’t done work for Jack in the Box; the firm just began to offer its services late 2014. The principal worked to provide several successful names before this, however, for smaller-scale and more radical purposes. Even without the benefit of the Nomnym process, which works to systematically include the perspectives of stakeholders and explore possibilities, Nomnym’s principal has developed several names for ventures. Here are some of these, in context, so that it’s clear how each one succeeded. 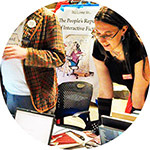 The local interactive fiction club for the Boston area. Putting “Boston” in the name didn’t seem right, because few members actually lived in Boston and the group was meeting in Cambridge. However, no one uses the term “Cambridge-area.” “Interactive fiction” is a somewhat awkward phrase, but it’s the standard term for the type of digital media work, the type of text-based computer game, that was (and is) the club’s focus. The solution was to extend the awkwardness of that phrase into this amusingly long-form name. The name resonated with club members because Cambridge is sometimes called “The People’s Republic of Cambridge” due to its stereotypically liberal leanings. “pr-if.org” was available. The first book on interactive fiction has, as its title, a phrase from Adventure, the first interactive fiction, which literally describes a convoluted cave and figuratively describes interactive fiction itself, with textual passages that twist and recombine under the control of a computer program. A reading series for digital writing at MIT. Computing and the digital are ordinary in this context, while the Institute’s creative writing history is less well-known. 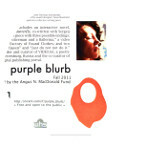 The “Purple” comes from Gelett Burgess’s famous poem “The Purple Cow.” Burgess, the first graduate of MIT to attain fame as a creative writer, also coined the word “blurb.” “Purple Blurb” is highly memorable due to its phonetics and the way the phrase seems to sit on the boundary between sense and nonsense, referring to “purple prose,” endorsement, excess, and fun. The logo is orange. 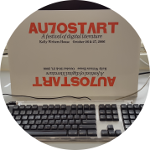 A festival of digital writing at the University of Pennsylvania, put together with very minimal funding and support thanks to the Kelly Writers House. The name describes the DIY nature of the conference and its focus on the digital, while inviting all sorts of writers who are interested in innovation and new beginnings. This book on the Atari Video Computer System (Atari 2600) has a name that relates to unique properties of the system and how it was programmed. 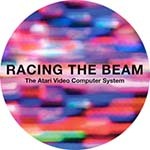 Programmers did not have access to a frame buffer in which the whole screen was set up — as was typical of videogame systems and computers, even at the time — but had to set up registers properly each time a line of the display way to be drawn, each time the beam of the electron gun swept horizontally across the screen. While doing so wasn’t actually a race, this came to be called “racing the beam,” and the term is both exciting and extremely apropos. This academic press book went to a third printing two week after it was published; a paperback edition was later prepared. The book, co-authored by 10 people, is available for free download and more than 50,000 copies were downloaded in the first six months after publication. The title is the entire computer program that is the focus of the book. 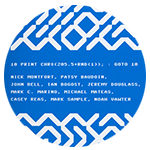 Although it is cryptic-looking, it emphasizes that a very small amount of code can be interesting and culturally relevant, and it proved extremely attention-getting. A digital media collaboration involving video, fiction, and poetic writing, between three people, partly developed on a train. 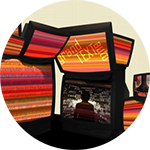 Unlike a traditional piece of video art, it runs and computes different story configurations “live” in an installation. Incidentally, the artwork itself contains a title generator by Nomnym’s principal so that segments of video can have different titles framing them. Translated to French as Trois rails sous tension. The title of this book, pronounced “shebang,” consists of the first two characters of most files containing scripts or interpreted programs. The “shebang” tells the system to use whatever follows to run the file — that the file is a Perl, or Python, or Ruby, or other program. “Shebang” also means “the entire universe of things that is under consideration,” as in “the whole shebang.” The book is a contribution to conceptual writing, published by a small press, most known to readers by word of mouth or via independent bookstores. 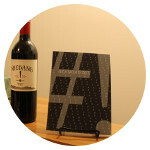 It is an essentially subversive offering; having no words, letters, or even numbers in the title is, thus, appropriate. This group blog covered a wide variety of topics in digital media, including but not limited to videogaming and matters of text and writing. (The slogan or mission statement at the top was, in fact, devised by Nomnym’s principal as a computer-generated one, changing each time a page was loaded.) The title pays homage to a series of compelling “open world” games that combine driving, platform-style gaming, first-person shooter interactions, adventure, and other genres. The title also suggests that participants are willing to “carjack” a variety of topics, from industry and academia, and bring them to the blog for discussion. Finally, it suggests that our goal as bloggers is to create a conversational “grand text” that is at least in some ways “auto,” that is, computer generated. While the title is easily recognzied as a play on the name of a popular video game series, the chance of someone confusing our academic blogging project with these games was zero. The blog ran for six years and led to an exhibit of the same name that was put up in California and then Illinois.